VANCOUVER , May 3, 2018 /CNW/ - IsoEnergy Ltd. ("IsoEnergy" or the "Company") (TSXV: ISO; OTCQX: ISENF) is pleased to announce that it has entered into an agreement with Cameco Corporation to acquire a 100% interest in 6 mineral claims constituting the 3,200 hectare Larocque East uranium exploration property (the "Property) in the Eastern Athabasca Basin of Saskatchewan . Craig Parry , Chief Executive Officer commented: "With higher uranium prices expected over the near to medium term, I'm very pleased to announce another significant addition to our portfolio of exploration properties in the prolific Eastern Athabasca Basin of Saskatchewan . IsoEnergy continues to execute on our strategy of opportunistic growth through exploration in the Athabasca and acquisition of undervalued uranium assets." Steve Blower , Vice President of Exploration commented: "Larocque East is a highly prospective uranium exploration property that contains a 15 kilometre portion of the Larocque Lake conductor system. The geology associated with these conductors has been proven to host high grade uranium mineralization nearby. Further, five known intersections of uranium mineralization are present on Larocque East, suggesting that the probability of additional exploration success is relatively high." Larocque East is immediately adjacent to the north end of IsoEnergy's recently expanded Geiger property and is 35 kilometres northwest of Orano Canada's McClean Lake uranium mine and mill (Figure 1). The Property covers the northeast extension of the Larocque Lake conductor system; a trend of graphitic metasedimentary basement rocks that is associated with significant uranium mineralization in several occurrences on neighbouring properties to the southwest. The closest of these are the Larocque Lake and Larocque North zones, which are located 6.5 kilometres and 0.5 kilometres, respectively, to the southwest of the Property boundary. Drilling at the Larocque Lake zone has returned intersections of up to 29.9% U3O8 over 7.0 metres in drill hole Q22-040. 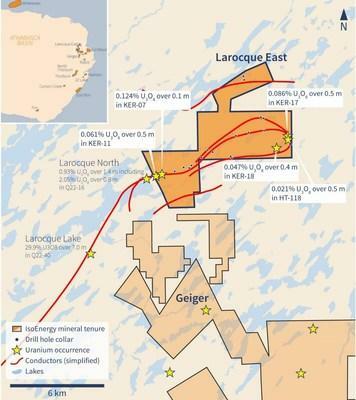 Drilling at the Larocque North zone, only 500 metres from the Property boundary, has returned intersections of up to 2.05% U3O8 over 0.8 metres in drill hole Q22-16. Like the nearby Geiger property, Larocque East is located adjacent to the Wollaston-Mudjatik transition zone - a major crustal suture related to most of the major uranium deposits in the eastern Athabasca Basin. Importantly, the sandstone cover is thin, ranging between 140 metres and 290 metres in previous drilling. A total of 21 historic drill holes have been completed on the Property along approximately 22 kilometres of graphitic conductors. Five drill holes have intersected weak uranium mineralization on the Larocque East property to date, including drill holes Ker-07 (0.12% U3O8 over 0.1 metre) and Ker-11 (0.06% U3O8 over 0.5 metre) near the western property boundary, close to the Larocque North zone. On the eastern end of the Property, drill holes Ker-17 and Ker-18 both intersected weak uranium mineralization during the most recent drilling campaign in 2009. Follow up drilling was recommended at the time due to the presence of the mineralization and strong graphitic structures in the basement. All uranium mineralization intersected to date has been at or very close to the sub- Athabasca unconformity. With previous exploration on the Property being focused on unconformity hosted uranium mineralization, Larocque East remains underexplored for basement hosted uranium deposits. IsoEnergy plans to explore the Property with additional core drilling programs, with priority given to the evaluation of the weakly mineralized areas for basement hosted uranium. In exchange for a 100% interest in the Property, IsoEnergy will pay C$20,000 in cash and will issue 1,000,000 common shares to Cameco Corporation. The shares will be subject to a 4-month hold period and the transaction is subject to TSXV approval. The scientific and technical information contained in this news release was prepared by Steve Blower , P.Geo., IsoEnergy's Vice President, Exploration, who is a "qualified person" (as defined in National Instrument 43-101 – Standards of Disclosure for Mineral Projects). Mr. Blower has verified the data disclosed. This news release refers to properties other than those in which the Company has an interest. Mineralization on those other properties is not necessarily indicative of mineralization on the Company's properties.